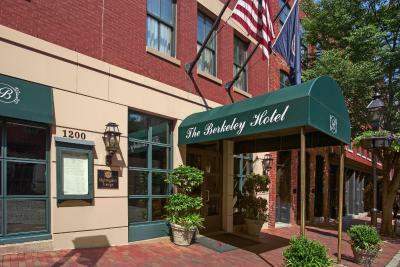 Lock in a great price for The Berkeley Hotel – rated 9.1 by recent guests! Room was very clean and the bed was firm and comfortable. Breakfast was good and service excellent. Room was very comfortable and beautifully decorated. I was so surprised at the hotel. The view, the atmosphere, the value for the price point. I am already planning on staying there on my next trip to richmond. Great location only two blocks away from the state house with great restaurant options nearby. Large spacious room. Breakfast was good with reasonable prices. The staff at front desk, bar and restaurant. All were very friendly and helpful as we planned a fun weekend. We had to wait for our room to be cleaned but that was on the heels of a very large group leaving. Great hotel, very good location, staff was great, and the restaurant was better than expected. The spaces are lovely and clean. Morning staff couldn’t have been more friendly, but the evening staff at check in was not particularly happy or friendly at all. She wasn’t rude by any means, just perfunctory. The breakfast staff was outstanding. The Berkeley Hotel This rating is a reflection of how the property compares to the industry standard when it comes to price, facilities and services available. It's based on a self-evaluation by the property. Use this rating to help choose your stay! One of our top picks in Richmond – and a guest favorite. In downtown Richmond, Virginia, this hotel features an on-site restaurant and free Wi-Fi access. The Virginia State Capitol is a 5-minute walk away. The guest rooms at The Berkeley Hotel all feature a flat-screen TV, sitting area with a sofa, and a coffee maker. They are decorated with traditional cherry wood furnishings and soft colors. A business center with copy and fax services, valet parking, and laundry facilities are included at The Hotel Berkeley. Guests have access to Jamestown Center fitness club. The Dining Room Restaurant serves locally grown cuisine for breakfast, lunch, and dinner and has a full-service bar. A gourmet brunch menu is offered every weekend. Interstate 95 is just 1 miles away. The Museum of Edgar Allen Poe is less than a 15-minute walk from the hotel. When would you like to stay at The Berkeley Hotel? This room features a flat-screen cable TV and coffee making facilities. This room features a flat-screen cable TV and a work desk. This single room features a seating area, bathrobe and CD player. This single room has a CD player, seating area and air conditioning. This double room features a sofa, seating area and soundproofing. This single room features a balcony, seating area and bathrobe. This double room features a balcony, air conditioning and CD player. House Rules The Berkeley Hotel takes special requests – add in the next step! The Berkeley Hotel accepts these cards and reserves the right to temporarily hold an amount prior to arrival. The was no refrigerator in the room just an ice bucket with the ice machine on level 5. The view from the window (on the sixth floor) was of the windows of the building a couple of metres away. Comfortable hotel with pleasant and helpful staff. It is located on a street with many restaurants so we were not limited to the hotel restaurant (though it was fine). Walking distance to most of the things in which we were interested during a short stay. Sheets on bed were rough Clean, but not ironed, and low thread count. The booking.com listing said there was free breakfast, but there was not. There was a restaurant in the lobby where you could pay for food. Not necessarily an issue with the hotel itself. Big hotel feel with a boutique feel. Beds very comfortable. Restaurant was amazing. We did not like that there was not a mini fridge in the rooms, other than that, the hotel was great. The bell captain was not friendly at all. Parking was expensive. I thought Booking.com stated that parking was free. Not the case. Also was not impressed with the staff at The Cobblestone restaurant. That the front desk clerk charged the wrong card after I asked him not to ... but I think it was a mistake. He was very nice at check in.